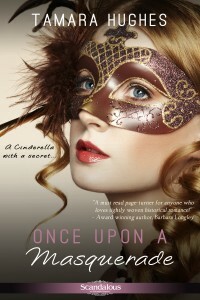 Hi, I’m Tamara Hughes, author of Once Upon a Masquerade, a Cinderella murder mystery romance set in New York City in 1883. This is an amazing time of year. Not only do the holidays give us an excuse to get together with family and friends, but they remind us to be thankful that we have those people in our lives. In a way, just like in the movies, it’s magical. While I may not have the childlike wonder I once had, I find the holidays to be filled with surprises, laughter, and love. I hope you all have a fabulous holiday season! And when January comes around, keep an eye out for my next book Tempting the Pirate. A Casanova pirate meets his match—a woman who sorely distrusts all men. Will he win her over? Find out soon. What’s your favorite thing about the winter holiday season? What’s your least favorite thing about the winter holiday season? Sometimes the shopping and baking gets a little stressful. I don’t like shopping, so for me, there’s nothing worse than cranky, aggressive shoppers in stores and parking lots. What would the perfect gift your hero would give your heroine and why? Although it wasn’t for Christmas, James does give Rebecca a gift in the book, and in my mind, it’s perfect. She loses her late mother’s locket during an encounter with the brutish men attempting to force from her what her father owes in gambling debts. James manages to get it back, but the chain is broken, so he removes his own (one that sports the lucky coin he always wears). He puts her pendant on his chain and secures it around her neck, along with the lucky coin. I find this such an endearing gesture. I love it. What would the perfect gift your heroine would give your hero and why? James values honesty above all else. When Rebecca finally confesses who she really is and why she’s been playing her charade, he feels a satisfaction like nothing he’s ever felt before. For him, that is the perfect gift. Where would your hero or heroine secretly hang some mistletoe to catch an extra special holiday kiss and why? Spencer Henley is a good friend to James and Rebecca throughout the book. He’s the type of man who truly enjoys the games high society plays. He finds all the gossip and petty fights amusing. I believe James and Rebecca would hide mistletoe in Spencer’s country house during one of his infamous parties just to give Spencer more to chuckle about. Share an excerpt of your favorite kissing scene between these two characters. “Never before,” Rebecca confessed with a small giggle. He pulled his hands away, and she glanced down as if first realizing he’d touched her. Her face pinkened sweetly, and she raised her gaze, but only got so far as his chest. Leaning toward him, she studied the lucky coin he wore on a chain about his neck. “What a unique charm,” she breathed, reaching out to touch the ancient metal. Miss Bailey worried her lip and studied his face. Her attention settling on his mouth, he wondered what she would do next. Christopher glanced at the empty doorway, where a large potted plant shielded them from sight, and questioned the sanity of what he longed to do. If caught, her reputation would be sorely compromised. What’s more, she’d been Nathan’s love. Despite the year that had passed, he should honor that relationship. He should, and he would. He stared down at her upturned face, delicate, alluring. She waited, utterly unconcerned by the open door. He liked that she was so different from the other ladies of the bon ton, different from Adele. Miss Bailey’s free spirit, so open and real, appealed to him like no other. Her pale pink lips tempted him to no end. Her scent, cloves and warm woman, wrapped around him, drawing him in, making his blood pump faster and his mind slow. Would she taste as good as she smelled? Without thought, he cradled her face in his hands, the silky softness of her hair teasing his fingertips. He lowered his head, sampled her lips, and was lost. *Hot* Summer Reads for *Hot* Summer Nights with Entangled Embrace!